Yesterday I got back into the swing of things and painted this yummy spring time treat. I can't wait for those first juicy red strawberries. It brings back memories of working in strawberry fields when I was in high school. I listed this painting on eBay last night. A rich pound cake is displayed in a red and white dotted cupcake liner and topped with fluffy whipped cream and a large strawberry picked straight from the garden. 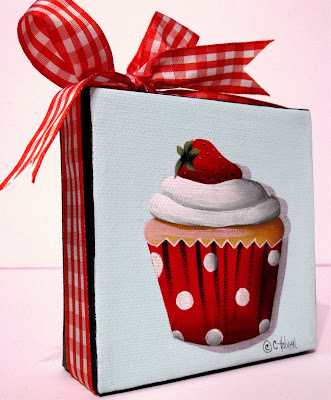 A red and white checked ribbon is wrapped around the edges of the canvas and tied in a bow at the top. My hubby became quite the photographer while we were there. I wish I knew how many miles we walked each day. That was our main mode of transportation besides the metro, trains, and buses. I've got lots of painting to catch up on, so I'll share more later. I've missed each of you and hope to catch up soon. What a cute cupcake! Your pictures look so cool. I'd love to be able to visit some place like that! It looks like it could be very Romantic! Thanks for sharing! 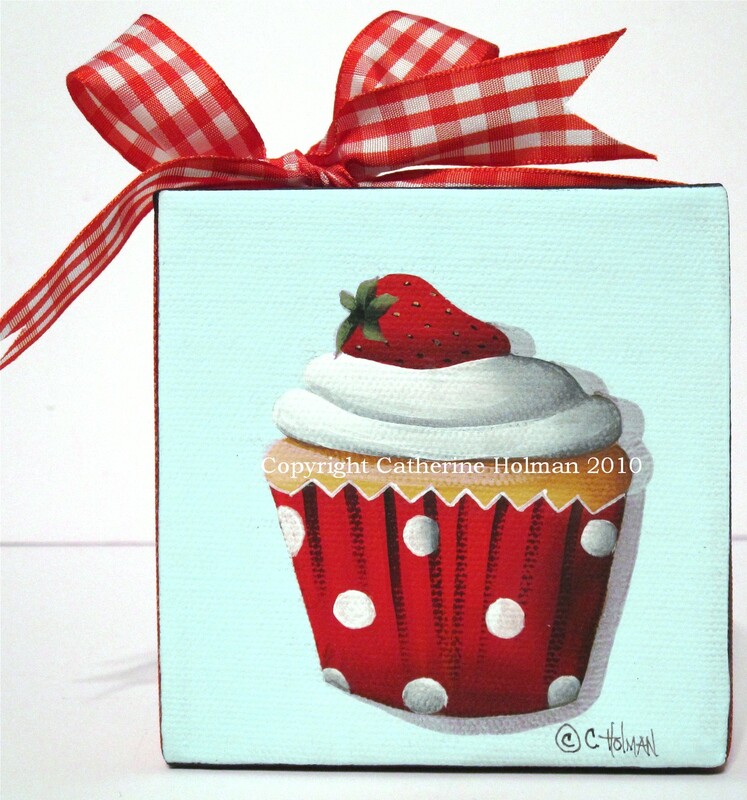 Cathie, I'm so glad you're back and I love the new cupcake! Whenever John and I have travelled abroad we walk and walk so much-it is great! WOW, that first picture is amazing!! Love that cupcake, Cathie! The photos are great. What a wonderful time you must have had. I'm glad to see you're back painting! Love your little strawberry cupcake. Strawberries are my favorite fruits too! I love that photo of the restaurant. Did you love Tapas as much as I do? Your strawberry-cace is very sweet. I bought some strawberry- plants just yesterday. So in summer I will bajke my own little strawberry cakes. Oh, what a lovely trip. All that walking probably worked off the tapas and the cupcakes that were your models!